We admit it — we're suckers for men who know how to style themselves. And while we admire the Brad Goreskis out there who can rock electric brights and leopard print, not every guy wants to turn it up to 11 every day. Sometimes, it's enough to just hint at the killer style that lies within. That’s why Ginger Root’s exclusive new collection from Metal Musings resonates with us — the cufflinks and tie bars are imbued with a distinct vintage vibe, which is just enough to give your dapper dude a fashion-forward push without making him feel overtly dandyish. 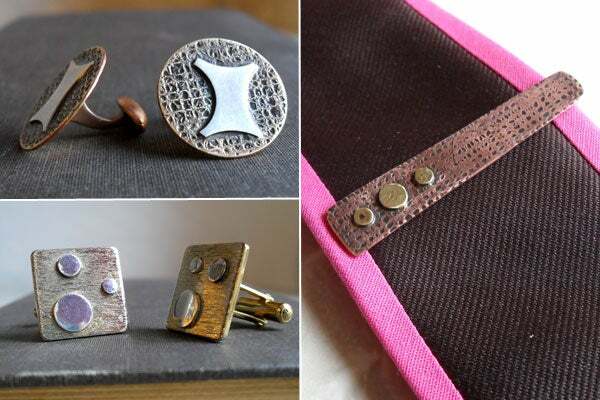 Each item is handmade, one-of-a-kind, and eco-friendly, so these babies will definitely earn your fella some bragging rights (both about his new gear and his super-sweet significant other). You can shop the selection online, but we suggest hitting up the shop's Booze 'n' Buy event on Friday evening, where you'll be able to mingle with local artists and shop new items with a drink in hand. Sounds like an ideal date night to us! When: Friday, February 3, from 6 p.m. to 9 p.m.
Where: Ginger Root, 1530 U Street NW; 202-567-7668.